The drumming of the male Ruffed Grouse is one of the most evocative sounds of the North American forest. Familiar as these accelerating burps are to hunters and hikers, the origin of this bizarre sound was long a mystery. It took the advent of wildlife cinematography to solve the riddle. In the spring of 1929, Cornell University’s Arthur A. Allen filmed a drumming Ruffed Grouse. Frame-by-frame analysis showed the bird’s wings were striking nothing but air — hard and fast enough to produce popping sounds that ran together into the whirring drum. 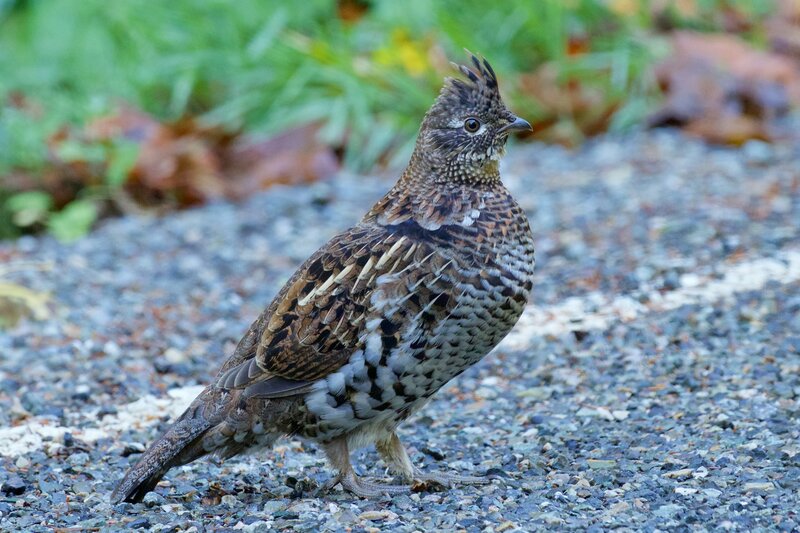 It may be the weirdest noise in the woods: the thrumming whumps of the male Ruffed Grouse. Familiar as these accelerating burps still are to hunters and hikers of the north woods, the origin of this bizarre sound was long a mystery. More than 250 years ago, the famous Philadelphia naturalist, John Bartram, informed his English colleagues that the grouse produced their drumming “by clapping their wings against their sides.” Others hypothesized that the sound arose when the wings were beat against the puffed-up breast, or when they were clapped together. Some suggested that the bird was striking its perch with its wings or even its feet. It took the advent of wildlife cinematography to solve the riddle. In the spring of 1929, Cornell University’s Arthur A. Allen filmed a drumming Ruffed Grouse. Frame-by-frame analysis proved that the wings were striking nothing but air — hard and fast enough to produce popping sounds that ran together into the whirring drum. No longer a mystery, the drumming of the grouse remains one of the most evocative sounds of the North American forest. Bird sounds provided by The Macaulay Library of Natural Sounds at the Cornell Lab of Ornithology, Ithaca, New York. Ruffed Grouse  recorded by Bob McGuire.